An inventor has created what he claims is the world’s first motorcycle powered by fresh air. “It actually fires out cleaner air,” said 37-year-old Stansfield, who used to be a sheep herder. The University of Bristol aeronautics graduate fitted the Puch with high pressure carbon fibre air cylinders used by fire fighters as breathing apparatus in burning buildings. The cylinders power two rotary air engines which in turn drive the chain to the rear wheel. Unlike electric scooters, it takes just seconds to recharge from larger air tanks filled by a diving compressor. 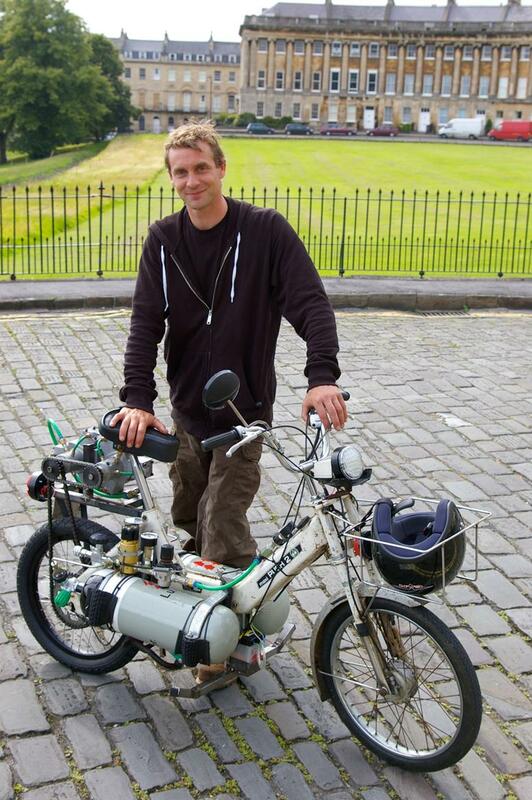 TV presenter Stansfield built the scooter for a National Geographic channel documentary, Planet Mechanics. Viewers can see him test ride it in Bristol when the programme is aired on June 3 at 6pm.